As I write this article the national frenzy set of by two nurses who contracted Ebola while caring for a patient continues. A physician returning to the United States developed symptoms and was hospitalized per protocol, and politicians quickly jumped in to quarantine a nurse returning to the US from treating Ebola patients. Apparently everyone is concerned about protecting everyone in the US. The CDC suggests that hospital acquired infections (HAI) now infect 1 out of every 25 patients. Stated differently more than 700,000 people are infected, and 75,000 of them die which means about 205 people die of HAI every day of the year. As a physician on staff at a Medical Center designated to accept Ebola patients, I was required to view multiple training videos on the proper procedures for putting on and taking off all the personal protective gear required for contact with a patient. This requires about 40 to 60 minutes (roundtrip) of precious time. I also learned that every time a worker is required to enter or leave the room, another worker needed to be on hand to observe the entire process. What struck me was the meticulous attention to detail and the extra precaution necessary to prevent a healthcare worker from getting infected. While the causes of hospital acquired infections vary, meticulous attention to detail and following strict protocols has been shown to reduce infection rates. Also, limiting the number of people who enter a patient room decreases the potential to spread disease. The rise in patient morbidity and mortality associated with hospital acquired infections suggest the need for newer approaches to managing hospital patients. 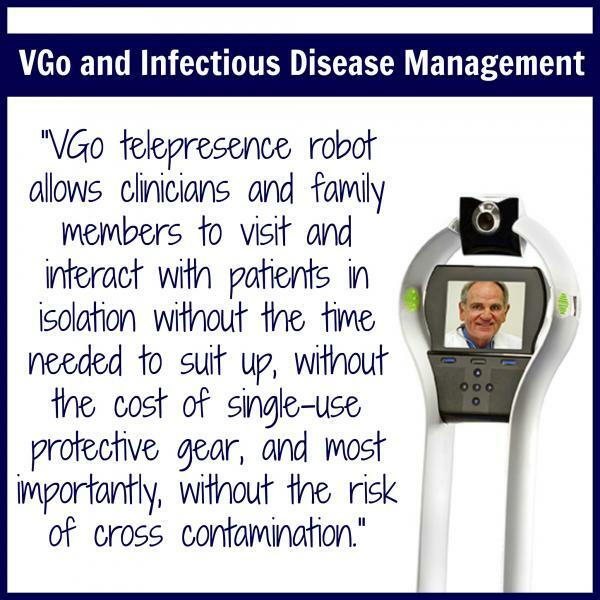 In the present environment, the VGo telepresence robot allows clinicians and family members to visit and interact with patients in isolation without the time needed to suit up, without the cost of single-use protective gear, and most importantly, without the risk of cross contamination.